St. Martin's Griffin, 9780312382506, 448pp. Saturday 09:11 Hours: A blast rocks a London hospital and thousands are dead or injured… 10:09 Hours: Joe Ledger arrives on scene to investigate. The horror is unlike anything he has ever seen. Compelled by grief and rage, Joe rejoins the DMS and within hours is attacked by a hit-team of assassins and sent on a suicide mission into a viral hot zone during an Ebola outbreak. Soon Joe Ledger and the Department of Military Sciences begin tearing down the veils of deception to uncover a vast and powerful secret society using weaponized versions of the Ten Plagues of Egypt to destabilize world economies and profit from the resulting chaos. Millions will die unless Joe Ledger meets the this powerful new enemy on their own terms as he fights terror with terror. 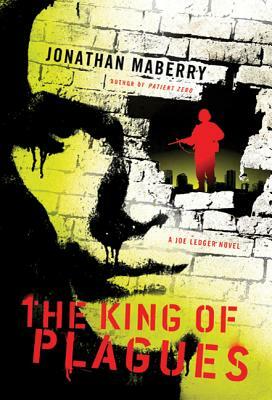 JONATHAN MABERRY is a New York Times bestselling and multiple Bram Stoker Award-winning author of Deep Silence, Kill Switch, Predator One, Code Zero, Fall of Night, Patient Zero, the Pine Deep Trilogy, The Wolfman, Zombie CSU, and They Bite, among others. His V-Wars series has been adapted by Netflix airing later this year, and his work for Marvel Comics includes The Punisher, Wolverine, DoomWar, Marvel Zombie Return and Black Panther. His Joe Ledger series has been optioned for television. “While most are content to sleepwalk through the third book in a successful series, Jonathan Maberry wages all-out destructive war on complacency. "The King of Plagues" expands the Joe Ledger universe, deepens existing characters while introducing bold new ones, and unleashes a runaway brain of a thriller plot turbocharged with a depraved spirit of invention. Next to Joe Ledger, Jack Bauer, Fox Mulder and Jason Bourne are rank amateurs.” —Javier Grillo-Marxuach, Emmy Award winning writer/producer, "Lost," "Medium," "The Middleman.